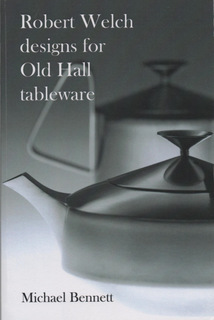 High quality book by Michael Bennett covering ALL the Robert Welch designs for Old Hall tableware. First published in 2009, sold out, now reprinted. 77 pages, mostly black/white but some colour, 8” x 5.1/4”. Fully indexed and with photographs and notes about every item. Completely revised, easy-to-access A4 format of more than 150 pages. Many newly discovered items that are not listed in Old Hall catalogues. Over 2,500 individual items are described. Nearly 1,000 illustrations, including some in full colour. This is the only single source of information on Old Hall stainless steel tableware anywhere in the world. Back copies of all the Newsletters are available at 50p each plus £1.00 p/p for any quantity; please state which issue numbers you require. This double sided A4 sheet is laminated and illustrates, with dates and notes, the main backstamps used by Old Hall over the years. Pictured left are some typical examples. Please enclose your name, address and telephone number with your payment.